My little girl is just around 16 months and she knows a little more than a handful of words. She is very social and I love it. At this age with my son, he also knew some words, but due to seizures he eventually regressed, and his words turned back into baby babble. One thing that I decided to try with him when this happened was baby sign language. I had seen videos of babies doing it and I thought it looked amazing. I took American Sign Language in college and that actually was one of my favorite classes. I thought it might be a good idea to try and teach my son some easy signs. What I did was make my own flash cards with the names of simple things around the house and would sign each card and also say the name when I did it. Now, keep in mind, he wasn't even anywhere near his second birthday yet, but he picked up the signs so quickly. I was impressed and decided to make even more flash cards and even just signing pictures in books, pointing and signing to things when we watching movies, when we were out running errands, you get the jist. He was signing so well and communicating with me, and it literally blew me away. I was so proud of us both because I could understand exactly what he wanted while he couldn't actually say the words correctly with his mouth. People would stop and watch him sign when we were out places and always asked how I got him to start signing. He always had an audience. What I'm trying to tell you guys is that a child's brain is an amazing thing. Many people don't realize just how much they can learn at such an early age. Just because you can't understand their baby babble or gestures when they are babies, doesn't mean that THEY can't understand you or their surroundings. They might be trying to communicate with you in many different ways. Why not actually teach them simple signs that you can both use? Yes, you can start signing before the age of two. You can even start exposing baby to signs before the age of one!!! They may not start signing right away, but the more you show them, the more it will be put into their heads, and one day they just might surprise you. In my opinion, learning how to sign with your baby just makes both your life and their life so much easier. There are many DVDs, books, and programs out there that can teach you and your baby or young child. One of my favorite programs that I've been using with my daughter is Baby Signs . As you can see in the picture above, they have quite a few different tools to use. These are only an example of some of the things that they have. They have many other books, movies, curriculum, posters, toys, CDs, flashcards, reference guides, and more. They have some available in both English and Spanish. I actually like that because we speak some Spanish in our house as well. They also have an affordable instructor program, which I plan on completing soon. I would love to get certified as a baby signs instructor and help other parents learn how to sign with their little ones. I've been using the products provided in the picture above for a little over a week now, and my daughter has already picked up most of the signs from the DVDs and charts. These two DVDs are so cute. They have music and animated characters that show you and your baby how to sign, as well as real people signing. The movies are short and very entertaining. My baby brings the cases over to me everyday when she wants to watch. Normally, she isn't much for watching things on t.v. but she sure loves these two. Her face lights up whenever the movies start and she gets really into watching them. I can see a lot of other kids liking these DVDs because they're fun. My daughter started showing signs of potty readiness about a month ago, so I have been trying to get her to use the potty regularly. She will use it from time to time, but isn't fully potty trained yet. Yes, there is a potty training kit! This kit, as shown, comes with a helpful DVD, book for you filled with tips and signs, a board book for baby with signs, a train whistle, and reward stickers. This kit couldn't have arrived at a better time! I've been using this with her, and it's made our potty training journey just a bit more simple. Just yesterday, I signed the word potty when she got up, she nodded her head, I put her on the potty and she used it. Then when I signed, "All done", she shook her head and signed the word, "more". Sure enough, she wasn't done yet. She also signed that she needed to wash her hands. I was so proud of her. This kit really works. I hadn't even thought to teach a baby this young to use the potty, but it can be done. I think that this is such a helpful, info packed book. It is the perfect companion when learning how to communicate with your baby through sign language. 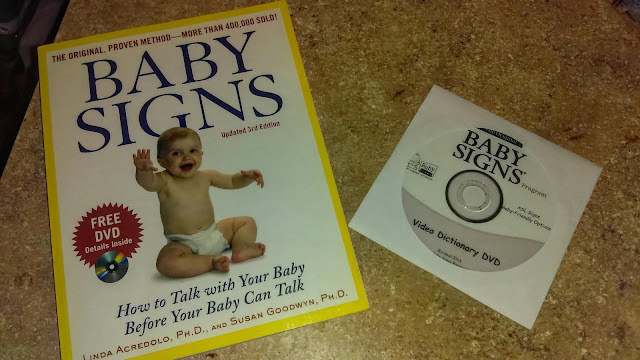 There are several ASL signs demonstrated in the book, as well as baby friendly ones. Included are real stories of families who have used signing as a way of communication with their children. I highly recommend this book. The bonus DVD is a visual signing dictionary that is excellent to use as a reference. It also includes info on potty training. Now, this book, is also excellent. Why? 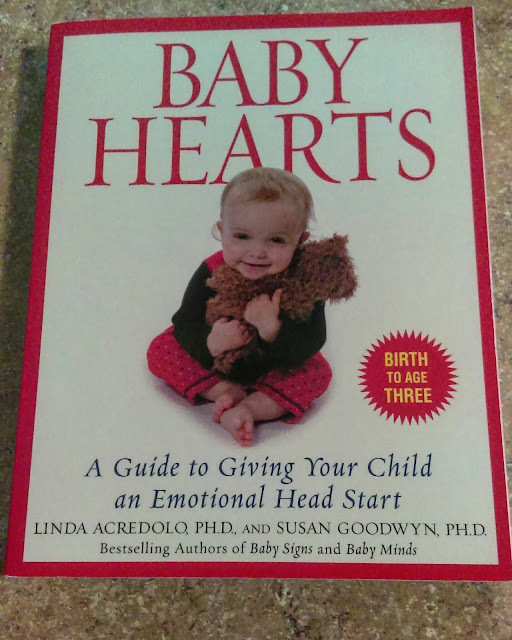 Because it teaches you how to help guide your little one to express their emotions in a more effective manner. Teach them how to deal with being shy, feeling upset, how to develop healthy friendships with others, and how to cope with several other life challenges that may come their way. There are activities that you can try with your child and success stories from families that have done the same. Aren't these reference guides cool? I have a few in English and in Spanish to give away. They have quite a few signs on the front and back. There are some helpful tips on the backs too. They can be pinned to your wall, or folded up and carried in your purse or bag for when you're out and might need to some sign reminders. I like the adorable little illustrations and find these guides really helpful. Here is a short video of my daughter practicing some of the signs that she has learned from the program. She actually knows around 32 signs now! Here's your chance to win a Baby Signs Reference Guide. They are available in English and Spanish. All you have to do is enter the simple giveaway below. Must be 18 or older and live in the U.S. Ends 9/15/2016 at 12:00 A.M. CST.